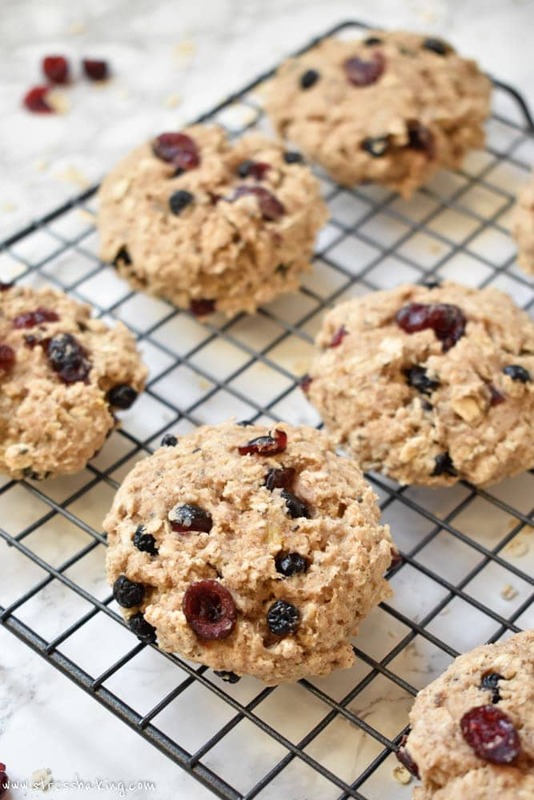 Super soft, chewy banana cookies filled with dried berries – the perfect grab and go breakfast cookies! Gluten free, dairy free, and refined sugar free. I wanted to post a new recipe during the first week of January, but unfortunately between the arctic temperatures, blizzard, more arctic temperature, and being in a house surrounded by coastal floodwaters… getting to the store for ingredients was not so much an option. My car wouldn’t start because of the cold, my car key fob died (maybe also because of the cold? ), but even if I HAD made it out, most stores had shut down because of the weather. Apparently it just wasn’t meant to be. But! While I was stuck at home, I started playing that game we’ve all played at one time or another where you start making weird meals out of what you have in the pantry. It’s amazing how creative you find yourself to be during that game. You find yourself with pickles, a jar of minced onion, chicken broth and a box of Cheez-Its, and somehow you turn that into a delicious meal. Okay, well, maybe not delicious… but you did sustain yourself, so congratulations. The great thing about that game is that at least half the time I manage to scrounge something together that ends up being magically delicious. Wait… isn’t that the Lucky Charms slogan? Good lord. I’m not a damn leprechaun. During day three of The Great Pantry Scrounging Game, I really wanted cookies. Buuuuuut it was 8AM and I’m trying so hard not to just sit down with a dessert with my morning coffee. You’d think that wouldn’t take that much willpower, but the truth of the matter is that it might be the hardest thing I do every day at this point. When I bake some schtuff and it’s still in the house (since I don’t have an office to take it all to anymore), it’s allllllll fair game for breakfast. Chocolate cake? Sure. Pecan pie? Of course. Bourbon butter pecan ice cream? YUP. Since I left my job last month, I’ve tried to stick with my usual routine of getting up, taking a shower, making breakfast and coffee and then getting to work – but in this case, it’s on the blog and not heading out to catch the boat into the city. The one thing I can’t bring myself to do though… putting on pants. Pajama pants and yoga pants are my new uniform. When I start working again, it’s going to require some serious manpower to get me into a pair of big girl, professionally acceptable pants. Someone’s going to have to bribe me with cupcakes at the other end of the commute or something. ANYWAY. I had a few bananas lying around and was staring at a few almost empty bags of dried fruit. I considered making my all time favorite banana bread, but I didn’t have any milk – plus, I still really wanted cookies. 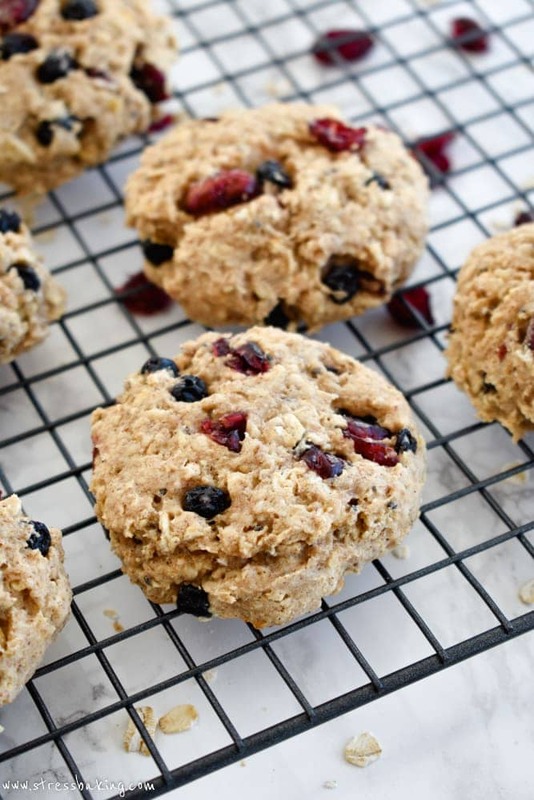 I’d been meaning to try to make some sort of breakfast cookies for a long time now, and since one of the things I was fully stocked on was Bob’s Red Mill gluten free flour I figured now was as good a time as any! And while I was at it, let’s make them paleo. 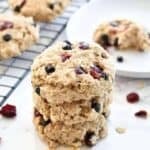 January is the month that everyone is trying to cut back on sugar and dairy, or trying new diets – so I hope this helps someone out here satisfy their own morning cookie cravings. By using banana, there’s no need for egg. It’s not a problem at all to use non-dairy milk like almond or coconut. Using whole old fashioned oats results in horribly dry cookies that have a terribly texture. Pulsing them to at least half their size is key. They don’t spread at all, so you have to make sure you flatten them to the size and shape that you want before baking. You don’t want to roll them in your hands because they end up being kinda tough and frankly, look unappealing. They don’t brown like a normal cookie would, so they don’t change color much, which I could totally see people finding off-putting. If you let them brown, they’re totally overbaked and dry and no one likes a dry crumbly cookie. Well… maybe you do, in which case I don’t judge. But that’s not what we’re going for here. They’re very soft and chewy, and to keep them that way you want to very loosely cover them and store at room temperature – but not for more than a couple days. The downside to this recipe is that you don’t want to make a giant batch of them to eat over time because they won’t last. However, you CAN store them, wrapped tightly, in the freezer if you want. Side note: How fricking cute is this little plate? It’s part of a set of four adorable punny appetizer plates from Pier One. They were a Christmas gift from Bill’s family and I love them so much. They’re perfect for my Food Pun Fridays! If you’re not familiar with those, follow me on Twitter and Facebook to see the puns flying about each Friday. I love when you guys participate, too, so just tag me or post to my wall to join in the fun! Now excuse me – I need to go make another batch of these and I want to give them my undivided attention. They’re a little needy. 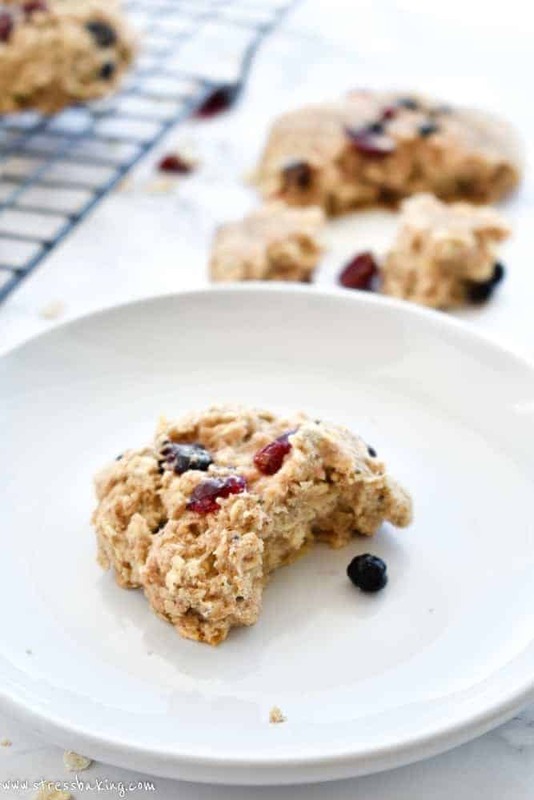 Super soft, chewy banana cookies filled with dried berries – a perfect grab and go breakfast cookie! Gluten free, dairy free, and refined sugar free. 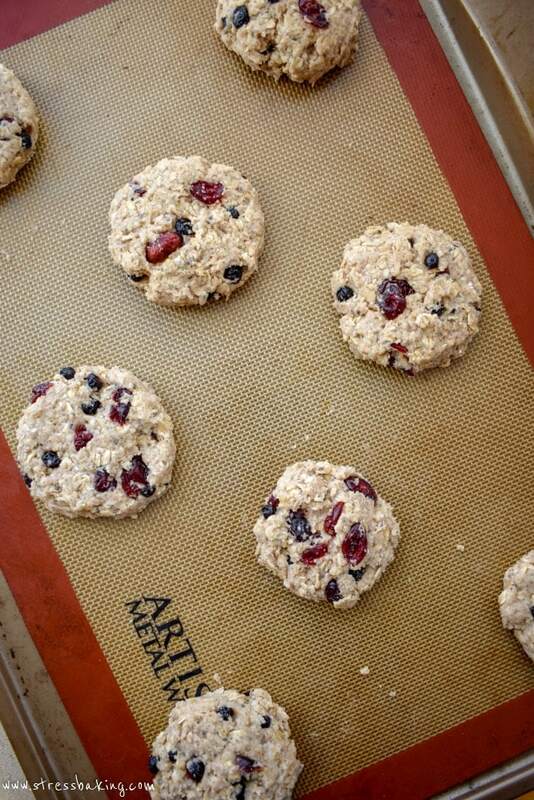 Preheat oven to 325°F and line a baking sheet with a nonstick silicon baking mat or parchment paper. Set aside. In a medium bowl, whisk to combine oats, flour, baking powder, cinnamon, chia seeds, salt and ginger. Set aside. In a large bowl, mash banana. Add almond milk, coconut oil, maple syrup or honey, and vanilla extract and whisk to combine. Add dry mixture to bowl of wet mixture and use a spatula to combine. Fold in dried blueberries and cranberries (and orange zest, if using). If the dough feels too sticky to manage, cover with plastic wrap and place in the fridge for 10-15 minutes to chill. 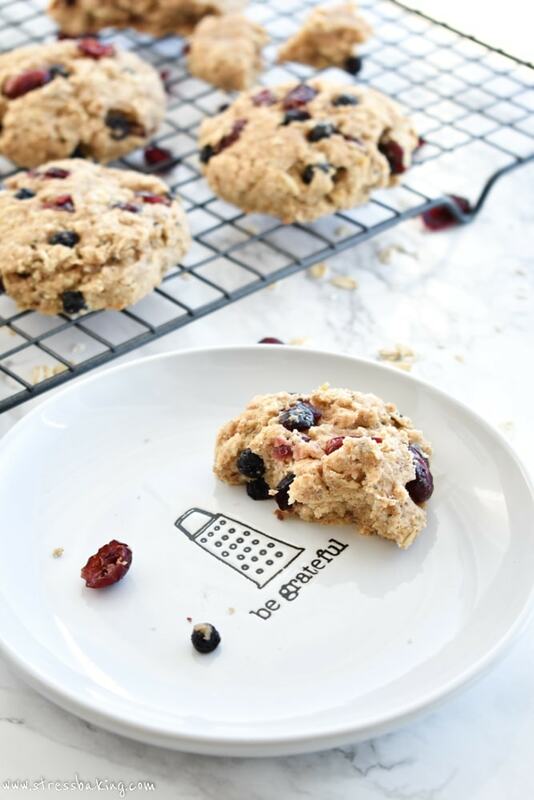 Using a large cookie scoop (the large scoops I use is 3 tablespoons) drop cookies on prepared baking sheet and use your spatula to flatten them to your desired size (they won’t spread while baking). 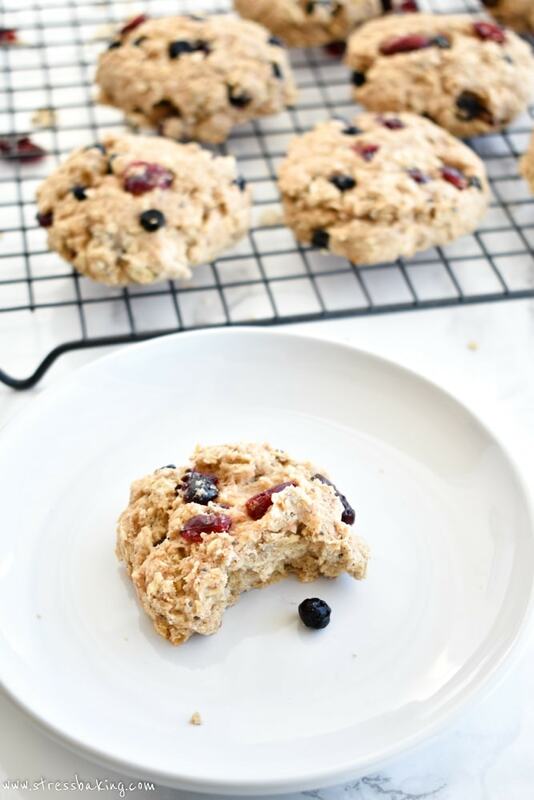 Press additional blueberries/cranberries into the tops of the cookies – it’s just prettier this way! If you don’t have enough room for all your cookies on one sheet, divide them between two baking sheets. Bake for 10 minutes and let cool on the pan for 10 minutes before moving them to a wire rack to cool completely. Store, loosely covered, at room temperature for up to three days – enjoy! I’m so glad my husband works outside the home so I have people to foist my baked goods onto. 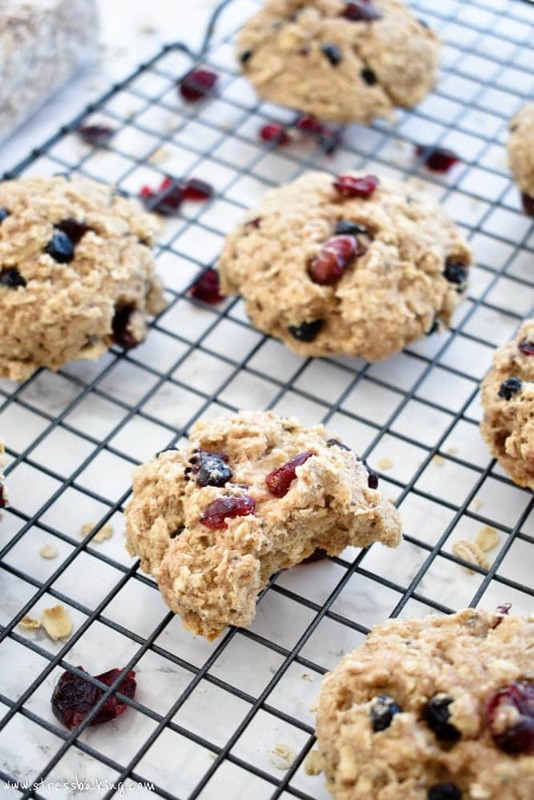 Making these healthy cookies instead is a good option, too! How did you know I was looking for a new breakfast cookie recipe? 😉 I can’t wait to try these. Love having this type of snack around! I’ve been stuck inside my apartment, trying desperately to make my heater work better, and just really hoping for an end to the arctic madness lol. I should’ve been making these!!! Love the plate and the cookies! My kids are going to go crazy for these. Also, yoga pants are my daily uniform. No shame. 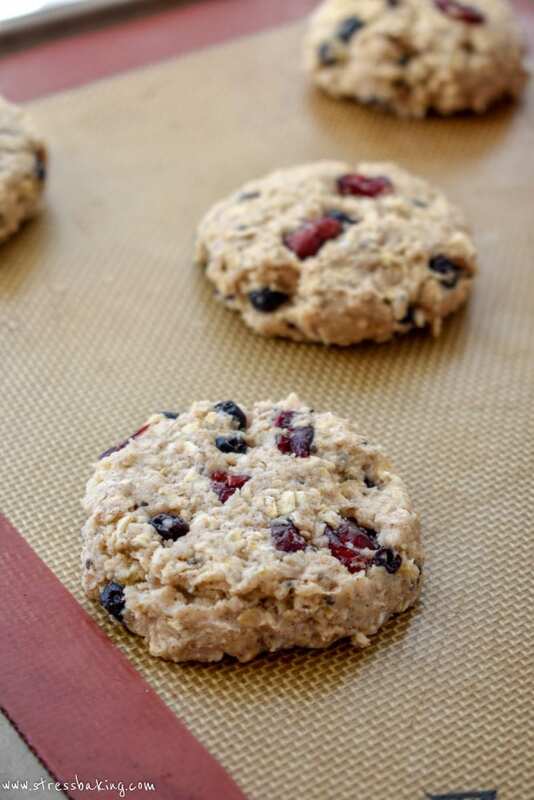 DH had just suggested I might look into breakfast cookie recipes… they’re just so convenient. I may have to try these! I also definitely struggle with morning cookie cravings, lol! Thanks for helping a girl out with these! I love your tips, especially about shaping them before baking! I would love to try these! And if I had access at all to a Pier One, you know I would be there looking for those plates – SO cute! 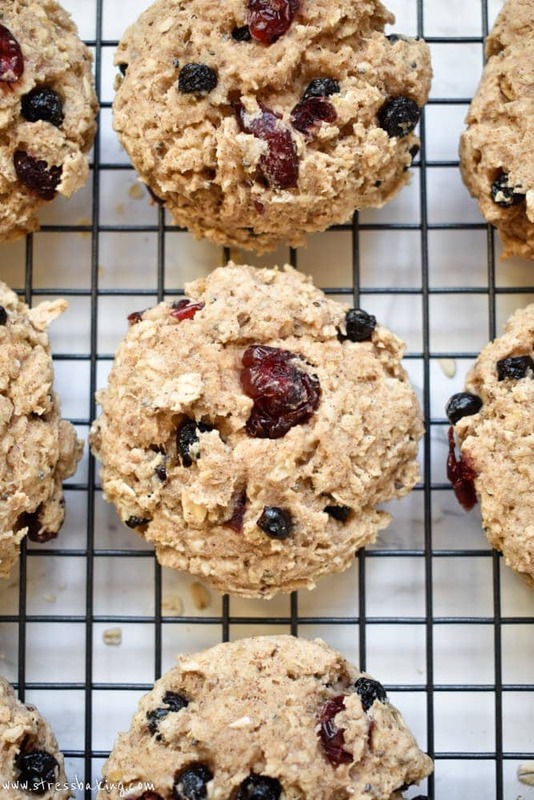 We do a lot of homemade no-sugar-added muffins for my toddler for breakfast. I usually find with the muffins, we don’t have to add ANY sugar because they get enough sweetness from the mashed banana. Do you think these would still be good without the maple syrup, or will they be too cardboardy in flavor without the extra sugar boost? I’m honestly not sure. But I’m not huge on the flavor of banana, so I sort of use the maple syrup to help cover it a bit, as well as add sweetness. Give it a shot without the maple syrup and let me know how it turns out! Wow! These are filled with so many good and wholesome things! I’m not a big breakfast eater but I could definitely get into these! 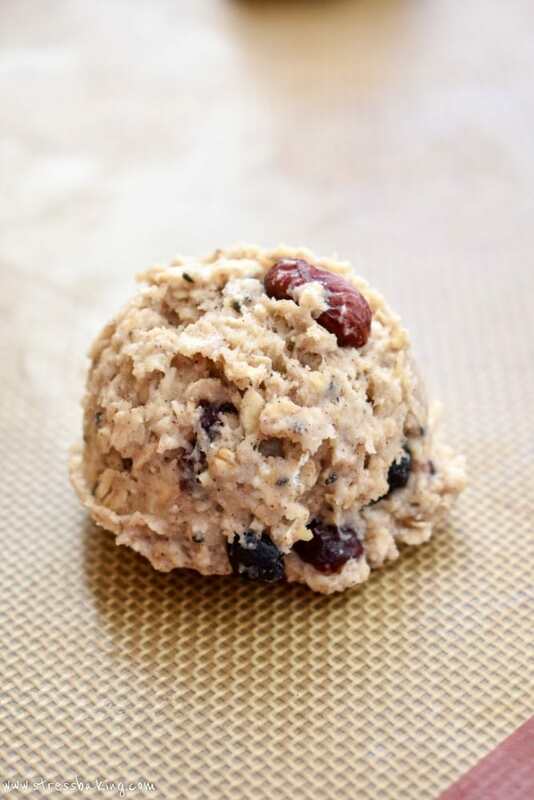 Such an easy and delicious breakfast cookie! Love the bananas in this, I will be making this soon! These sound so good and cozy! 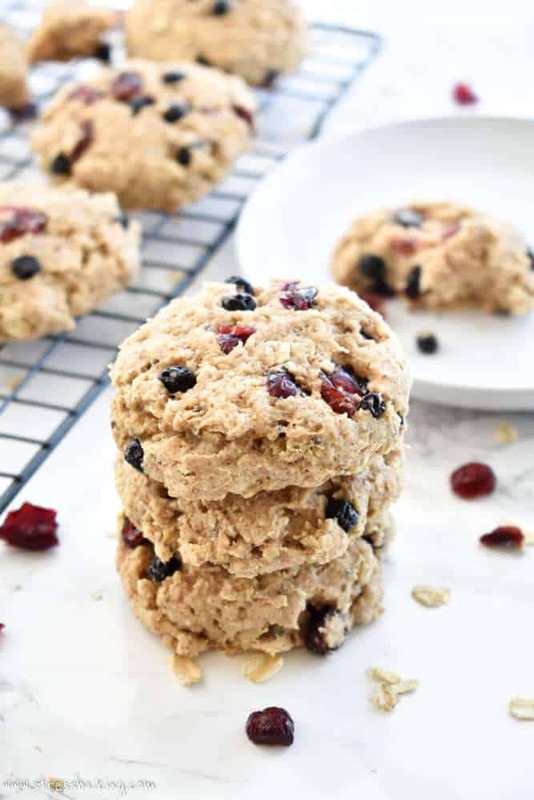 I had something somewhat similar to these over thanksgiving: butter scones with dried cranberry and yes those were amazing so I know these are gonna be good and the addition of chia seeds and all the other good stuff make this an overload of nutritious goodness! Love it!